Baseball is a game of numbers. 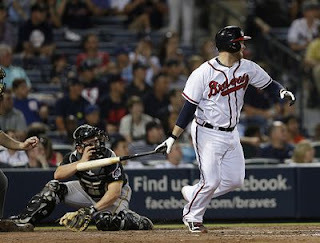 Last night Brian McCann hit a big one. For every boy that plays little league there is the dream, the dream of getting a hit in the majors. Brian McCann has done it one thousand times in his eight seasons with the Atlanta Braves. Truthfully, I didn't realize he was that close. Hit #999 came in the bottom of the fourth with Freddie Freeman on base. Brian took A.J. Burnett deep over the right field wall, putting the Braves up 2-1. Hit #1,000 came in the bottom of the seventh inning, a broken bat single that looped over the third baseman and into shallow left field. As he stood at first, the Braves marked the milestone on the jumbo-tron. To look at Brian, it was business as usual. Just another hit. As the ovation from the crowd grew, Brian looked down and then thanked everyone with a big smile and the tip of his batting helmet. It reminded me of a scene from a western movie. The quiet cowboy tipping his hat and saying, "just doing my job ma'am". That's what Brian McCann was doing. His job. And loving every bit of it. So this is what I don't understand. During the off season and throughout Spring Training, media and fans alike seemed to be obsessed with one thing. With Chipper's retirement, who would be the Braves new team leader? Me? I think these things happen organically. You don't tell someone they're the team leader. Someone just slips into the role. It happens naturally. But the baseball lemmings had to be told and the Braves made it loud and clear on Opening Day. As the team took the field from the center field gate, Jason Heyward led the pack. For the past two seasons, that was Chipper's spot. In 2013 it was Jason's. My question? Why wasn't it Brian McCann? 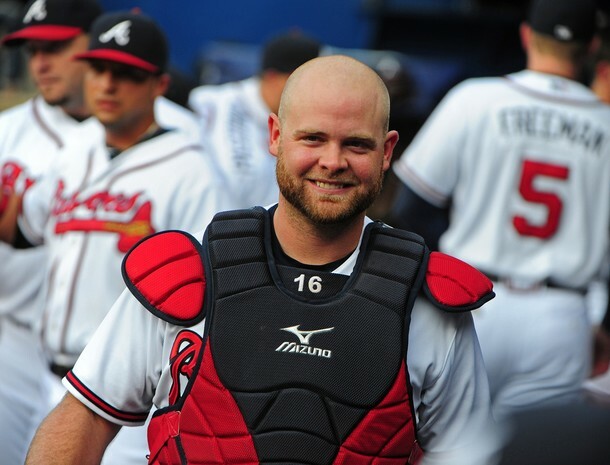 In my eyes, without a doubt, Brian McCann is the team's leader. And he's proved it on and off the field for eight strong seasons. Welcome to Chicks Dig Diamond & Dugouts! Atlanta, The City of Brotherly Love? I am a girly-girl who loves baseball. For me there's nothing better than spending a summer evening at the ballpark and I'm always hopeful that those evenings will extend well into fall. I'm a student of the history of the game and I love how it's woven into the fabric of the American experience. I have an appreciation for every baseball team and it's fanbase but my favorite team of all is the Atlanta Braves!